I’ve found my true calling. If a career in writing fails (see: the catastrophic state of the global world of journalism at the moment), I’ve found plan B: DJ ! Last Monday, I invaded the Cha Cha club with my sister (visiting Paris for a few days) and nightlife photographer/ DJ extraordinaire Jean Picon for “Les Américaines à ChaCha.” The crowd (yes, we had quite the crowd for a Monday night in early summer I might add) danced to our wonderful musical selection, and fun was had by all. Cha cha cha ! 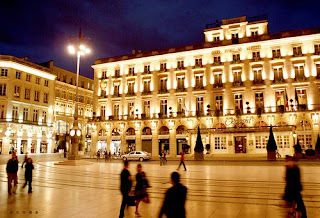 The Hotel Regent is the recently-opened 5-star hotel in the center of Bordeaux. I had the opportunity to stay a few nights in a “junior suite,” a vast and cozy space complete with comfortable beds, a re-done, modern bathroom, not to mention a welcome kit with wine and caneles (a Bordélaise dessert specialty). The hotel is located in the town’s center, so is a convenient place to stay, and also boasts a gorgeous view of the city. Extra points for the incredible buffet breakfast, one of the best I’ve had (and I’ve had many). The staff were charming – I highly recommend this spot for a trip to Bordeaux. Ratatouille would have been jealous. 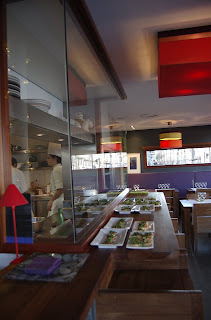 My sister and I had a birds-eye view of the kitchen at Gravelier restaurant in Bordeaux. 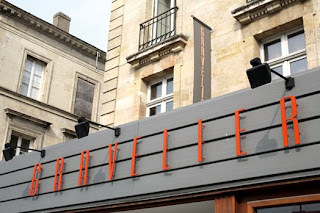 Located on the Cours de Verdun in the heart of Bordeaux, Gravelier offers some of the most flavorful, inventive – and surprisingly affordable – cooking in the city. We opted for the 39 euro prix-fixe menu, with a choice of two appetizers, four main courses and two desserts, just enough to give choice, but also force diners to be somewhat adventurous. We both started with a “vive piquante,” a filet of cold white fish served with a delectable mint-infused sauce and steamed langoustines in a mayonnaise-like creamy sauce. Then, my sister had the “galette estival de boeuf” (seasonal beef tart) which arrived in the form of thin slices of beef cooked to perfection atop a paper-thin pastry crust, with colorful vegetables, arugula and parmesan. I had the duck, served in savory chunks, with fresh cherries, a sweet and savory cherry sauce and accompanied by small, warm mini-cakes filled with sweet potatoes and vegetables. Both were simply divine. Our dessert was a “blanc en neige,” a soft, meringue-like white sugary ball on a skewer with marinated apricots and served with an apricot nectar sauce and warm chocolate sauce (mine came “sans chocolat” as requested of course!) The petit fours for dessert served with the coffee were also worth overcaffeinating oneself just to try them. The staff were warm and welcoming, and I highly recommend asking for the 2-3 seats at “le bar” to watch the chefs in action. Gravelier is closed Saturday and Sunday nights, and also offers a 28 euro menu serving the chef’s selection of the night or a 60-euro “menu carte blanche” including two fish appetizers, a meat dish, a cheese plate, a “pre-dessert” and a dessert and advertised as “trust the chef!” I certainly do trust the chef after our wonderful meal there and will be sure to return next time I’m in the city. Thanks to Madame Gravelier (owner of Gravelier, bien sûr), my sister, Erica, and I also discovered a wonderful Bordeaux spot, on the night after it opened ! Le Gabriel, new three-story bar, bistro and restaurant located in the center of Bordeaux’s Place de la Bourse overlooking the fountain and the river, opened the night before we dined there. Le Gabriel is run by chef Francois Adamski, a former chef in Bourges at a Michelin-starred restaurant, who has since settled in Bordeaux in an attempt to earn himself a star. Adamski was named "Meilleur Ouvrier de France" in 2007 and earned the famed "Bocuse d'Or" in 2001. He's taken his Bourges crew with him to the kitchen, but has a whole new look for the restaurant. "We had the different floors to work with - we had to imagine different things we could do with them," Adamski told me. On the first floor is a cozy bar area, complete with outdoor terrace for drinks or afternoon coffees when the weather is nice. On the second floor, a more affordable "bistro" (they call it a bistro, but it looks more like a très chic petit restaurant) offers lower-priced variations on traditional French fare. On the top floor is le restaurant gastronomique. The bistro seats around 80 guests and the restaurant just 30 lucky diners. The brand new establishment took just five months to work to complete. Adamski told me he is aiming for "simplicity and elegance" with Le Gabriel. The name "Le Gabriel" comes from the architect who designed the building back in the 1800s. We dined with a lovely view of the Place de la Bourse and the fountain, and we happened to be there on the night the city was celebrating the 75th anniversary of the French Air France. We stood on the balcony and watched as fighter planes flew overhead and the former head of Bordeaux’s Air Force retired during a traditional ceremony. A uniformed band played “La Marseillaise” as crowds gathered around to watch – it was extraordinary. Chef Adamski came out to give us a private tour of the restaurant and I saw his sous-chefs at work in the kitchen. They even gave him the famous “oui, chef!” when he placed an order. The food was, quite simply, fabulous. 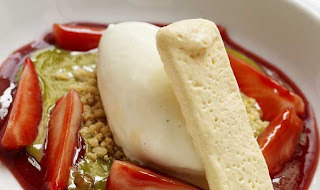 An amuse-bouche of a tomato stuffed with zucchini, eggplant and parmesan served with a crunchy cheese cracker awakened our taste buds, complemented with a choice of whole grain or white bread served with a sweet, delicious, fresh butter. For a starter, we both had the langoustines, cooked to perfection in a sweet and savory, thick mustard and passion fruit sauce with a little wasabi kick and fresh mango. I had the John Dory fish, served with a white wine cream sauce over a couscous "semoule" with cilantro and lemon confit, and my sister had a macadamia-crusted marlin with rice-stuffed cabbage. For dessert, I had roasted peach (cooked with the pit still in which, as the chef told me, adds flavor) served over a warm pistachio molten cake and verveine ice cream. My sister had a “vacherin” served with a meringue-like cold ice cream in peach, pistachio and almond flavors. The petit fours for dessert – macarons, financiers and dark chocolate truffles – were délicieux also. Big thanks to Chef Adamski for a wonderful meal, a personal tour of the premesis and a sneak-peek at the just-opened and not-yet reviewed (until now!) establishment. A bientôt ! 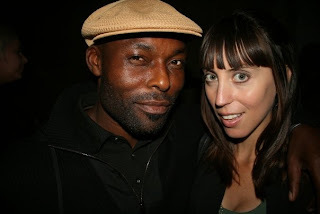 As we all know, the cooler a place, the less information one has about it. All of the hot spots in NY and Paris don’t even usually have a sign on the door, you’re just expected to know where they are. And now, to top off this trend, comes “Le Club Sans Nom” (“The Club Without a Name”), new hot spot sponsored by Russian Standard vodka, on the first floor of the Palais de Tokyo modern art museum. The launch coincides with new art expo A MAN ON THE MOON, a collection of photos of planet earth taken by astronauts from the moon. Pass through the fabulous expo on your way to the new club, open from 10 pm-2 am nightly through Sept. 20th. The NY loft meets Berlin garage club interior leads to a terrace with an extraordinary view of the Eiffel Tower. 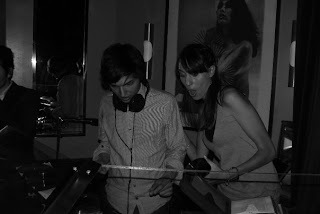 It’s the same Parisian hipsters you’ll see at Le Baron or the Cha Cha club (both locations are partners in the ephemeral spot), but in a different, more “cultural” space. Muriel Barberry’s book, currently translated to the big screen in French theaters in “Le Hérisson” starring Josiane Balasko, is the best book I’ve read in a long time. 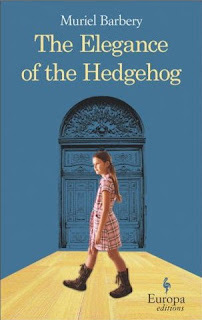 The moving yet humorous story is ostensibly esoteric, but in fact, a very accessible, relatable tale of a concierge in a bourgeois Parisian building. 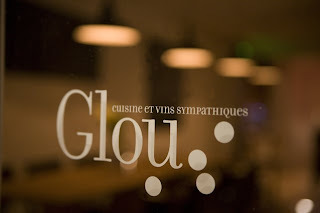 I’m stuck on this recently-opened restaurant like GLOU! (Sorry, the pun was just too evident to pass up, and it doesn’t work in French unfortunately.) This new hot spot, opened by former Regal – French food magazine – founder Julien Fouin and colleagues Ludo and Herve, is an affordable, casual and tres chic restaurant in my favorite neighborhood, le “haut Marais.” Right on the rue Vieille du Temple, Glou offers a wide assortment of dishes to please every palate – quality hams, a great cheeseburger, fish, and even a vegetarian plate for non-carnivores. Their gazpacho is a refreshing and flavorful pause on a hot summer day and, while the food is very basic with not much culinary adventure, all of the ingredients are high quality and tasty – think: melt-in-your-mouth bufala mozzarella with tomatoes so fresh they appear to have been just plucked from a country garden, a creamy “organic, raw milk” rice pudding and their original “Glou yogurt” for dessert. You can sit upstairs, or downstairs perched on stools around a big table or even on one of just three small tables outside. 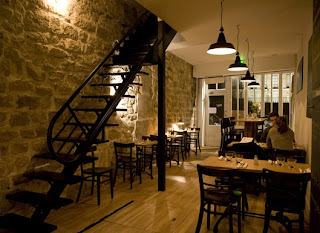 Glou is a great place for a “tête-à-tête” catch-up session with a friend or a fun place for a big group. I discovered this new spot not long ago and have been GLOUed to my seat there every since ! William Ledeuil’s white chocolate wasabi dessert is officially my new favorite dessert in Paris (and, perhaps, the world.) In fact, Ze Kitchen Galerie is currently at the top of my Paris restaurants list (I’d give Les Fables de la Fontaine the runner up spot). Ledeuil’s inventive cooking is a modern twist on classical French dishes with an Asian accent. Ze food is zelicious ! The name aptly describes the ambiance inside – an open kitchen with glass windows in the back, and modern art paintings all along the walls. The food is on the pricier side, but for a Michelin-starred restaurant, it’s actually quite reasonable. A yellow tomato gazpacho added intense flavor to my appetizer of fried creamy burrata balls – the most gourmet, and delicious, “mozzarella” stick you can imagine. The chicken and shrimp ravioli are also delectable. The duck main course is cooked two ways – one confit and the other a filet – the meat is cooked in an aromatic teriyaki-like sauce and swims on the plate alongside fresh seasonal vegetables. I also recently enjoyed the main course “rouget” (red mullet fish) served over an Asian-tinted mashed potatoes, quite possibly the best mashed potatoes I’ve ever had, with ginger, olives and other unidentifiable sauces and vegetables. Every mouthful is different, and satisfying. And then… dessert ! Yes, white chocolate and wasabi is indeed an odd couple – white and creamy chocolate meets Asian-infused spicy wasabi. It’s like the John Lennon-Yoko Ono of desserts. Green tea, pistachio sauce, torrone nougat, vanilla, fresh strawberries and crunchy cookies complement the flavors, all topped with a meringue. Special mention to our Brazilian waiter [insert name here if you know him or are him!] currently manning the tables, who is friendly and lovely and, when a slight confusion over our main course order occurred, offered us another dessert on the house that rivaled my white chocolate-wasabi favorite. Dessert number deux was a strawberry and passion fruit “cappuccino” with fres chunks of strawberries, a cream sauce and topped with vanilla ice cream. It was a symphony of flavors in my mouth – creamy, yet fruity and light at the same time. 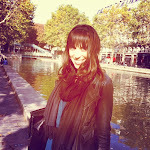 After the meal, take a walk along the Seine, right around the corner. As it is, it’s tough to get a reservation at Ze Kitchen, so please make sure to call me before to call in to make sure you don’t take my table, merci beaucoup. I fell in love with Claude Monet during my first trip to Paris when I was younger (yes, can you imagine a bigger cliché?) and it’s been a long love affair ever since. Monet’s nymphéas can be found at the recently-renovated L’Orangerie, complete with other impressionist works. Definitely a must-see. A picnic in the Tuileries gardens (see photo) followed by a tour of l'Orangerie is the perfect plan for a hot summer afternoon in Paris. I finally have my carte de séjour! Vive la France ! It expires in March, but still a victory after many days/weeks/months of suffering. Paris, je t’aime !